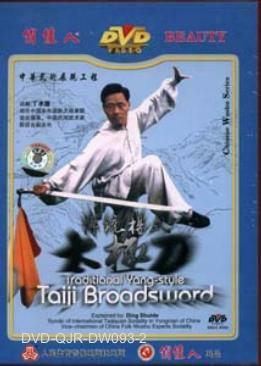 Traditional Yang-style Taiji Broadsword preserves the primitive demeanour with the sword swinging as fierce as a tiger and the footwork as agile as an ape. The basic broadsword techniques include: cutting, chopping, upper cutting, embracing, hacking, pointing, sweeping, parrying, hanging, thrusting, twining, holding and pulling, and it's also called thirteen-posture broadsword. It also features with hardness dwelling in gentleness, breaking down the opponent's attck by taking in and sending out, movements of vigour, and unpredictable changes.